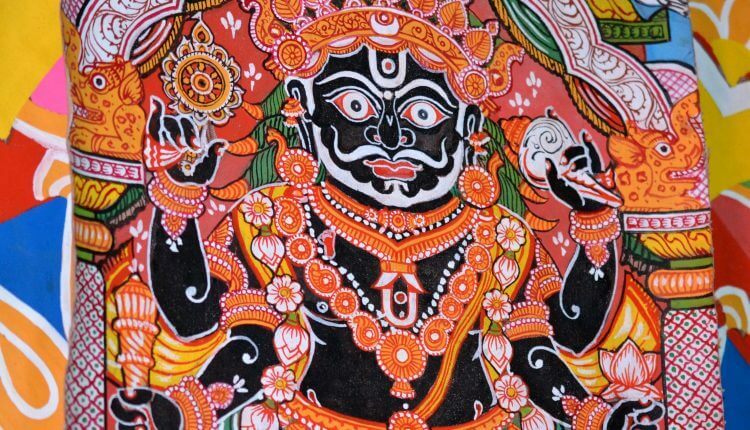 Jagannatha brushes his teeth and chews a ‘paan’ daily, but he does not take a bath each day. Well he does, but it is a symbolic ritual. Every morning, he is dressed in barebones clothing; only two pieces of cloth known as tadapa and uttari. The tadapa is wound around his waist while the uttari is thrown across his shoulders. Three metal mirrors are placed in front of the three deities and angled such that their faces are reflected. These mirrors are then bathed with scented water. This elaborate arrangement acts as the daily bathing ritual of the gods. Once in the year however, he comes out for an actual bath and when he does, the bath is with more than a hundred pitchers. That night he gets a fever and has to be cured for 15 days. This period is known as Anabasara, or the more colloquial Anasara. He is hidden from public view for this period and the people get to see three paintings in his place instead. These are the Anasara Pati paintings, humanised depictions of the beloved triad. Behind the partition however, the ailing deities need to be cured of their fever. And the only ones who have access to the secret chamber are the Daitapatis, believed to be descendants of the Sabara king Biswabasu who originally worshipped Nilamadhaba. The treatment inside is hence believed to be reflective of the Sabari tribal rituals. To everybody else, the secret of the Anasarachamber remains hidden. Only a flickering earthen lamp provides light to the enormous temple during this period. No loud instruments are rung because that would disturb the deities, who only wear a single white cloth and pure white flowers. It is said that there must not be even a single coloured petal in the floral ornaments woven during Anasara. It has to be pure white to maintain the solemn mood. For a temple that is bursting with colours, sounds and festivity throughout the year, this period is a dramatic departure. Shrouded in these surroundings is the mystery of the Anasara chamber. These secrets have remained secret for centuries. We only know a little here and a little there, but nothing more. Of the things that we do know are the few rituals that occur outside the temple. On the fifth day of Anasara, the Bada Odia Matha of Puri provides Phuluri Tela, a special kind of medicinal oil. Myriad scented flowers and barks combine with camphor, sandalwood and other ingredients to form this oil. The oil is actually kept underground for a year, then dug out and carried to the temple in earthen pots. This is said to provide relief to the ailing Gods. Also prepared is the Anasara Pana, a special drink made to cure. The Gods’ also have their very own doctors; the Baidya family. With their knowledge of ancient medicine, they prepare various medicinal concoctions, of which notable is the Dasamula Modaka or rounded pills of a special concoction whose ingredients are secret. Most of the other details remain unknown. This secrecy, as one would expect, has often stimulated curiosity. Back in the 12th century, Karnama Giri, a tantric expert came to know that the deities were ill. When he was refused a sight, Karnama rebelled – how could God fall ill? He somehow convinced the king that this was all a hoax and declared that he would expose it all. He first flew in as a fly, but he saw a lotus and so pungent was its smell that he fainted. Somehow he struggled outside through the crevice in the door. The next time he turned invisible, but inside he saw eight maidens who chuckled at his stupidity. Bewildered he acceded defeat and left. Stories such as these still lurk around. The practical point of view is that all the bathing washes off the colour, and the images have to be remade and repainted. This keeps the deities looking as new as ever. The last day is theNaba Joubana, when the completed deities are finally shown to the public. Before that the faces of the idols are painted. This work is done only by the Datta Mahapatra at Puri. The Datta Mahapatra family carefully keeps the Banaka Pothi in their home. This is their prized heirloom, and the only painting manual found in Odia palm leaf manuscripts. It mentions in detail how the three deities have to be painted. Like everything else concerned with Anasara, the contents of this manuscript too are a secret. After painting the eyes, eyebrows, eyelashes, mouth and nose, the eyeballs are filled with black at the very end. This concluding process of filling the eyes completes the images. A day later would be the magnificent Ratha Jatra, when the dormant temple would rise up again with the most splendid celebration of the entire year.